Sandra Day O'Connor (born March 26, 1930) is a retired Associate Justice of the Supreme Court of the United States, who served from her appointment in 1981 by President Ronald Reagan until her retirement in 2006. She was the first woman to serve on the Court. As a moderate Republican, O'Connor tended to approach each case narrowly without arguing for sweeping precedents. She most frequently sided with the Court's conservative bloc; having the swing opinion in many decisions. She often wrote concurring opinions that limited the reach of the majority holding. Her majority opinions in landmark cases include Grutter v. Bollinger and Hamdi v. Rumsfeld. She also wrote in part the per curiam majority opinion in Bush v. Gore, and was one of three co-authors of the lead opinion in Planned Parenthood v. Casey. Several publications have named her among the most powerful women in the world. On August 12, 2009, she was awarded the Presidential Medal of Freedom, the highest civilian honor of the United States, by President Barack Obama. Sandra Day was born in El Paso, Texas, the daughter of Harry Alfred Day, a rancher, and Ada Mae (Wilkey). She grew up on a 198,000-acre cattle ranch near Duncan, Arizona. The ranch was nine miles from the nearest paved road. The family home did not have running water or electricity until Sandra was seven years old. She hunted from a young age, using a .22-caliber rifle to shoot jackrabbits for food. She began driving as soon as she could see over the dashboard and had to learn to change flat automobile tires herself. Sandra had two younger siblings, a sister and a brother, respectively eight and ten years her junior. Her sister was Ann Day, who served in the Arizona Legislature. She later wrote a book with her brother, H. Alan Day, Lazy B: Growing up on a Cattle Ranch in the American West (2002), about her childhood experiences on the ranch. For most of her early schooling, O'Connor lived in El Paso with her maternal grandmother, and attended school at the Radford School for Girls, a private school. The family cattle ranch was too far from schools, although O'Connor was able to return to the ranch for holidays and the summer. O'Connor spent her eighth-grade year living at the ranch and riding a bus 32 miles to school. She graduated sixth in her class at Austin High School in El Paso in 1946. Sandra Day attended Stanford University, where she received her B.A. in Economics in 1950. She continued at the Stanford Law School for her law degree in 1952. There, she served on the Stanford Law Review with its presiding editor-in-chief, future Supreme Court Chief Justice William Rehnquist, who was the class valedictorian and whom she briefly dated during law school. She has stated that she graduated third in her law school class, though Stanford's official position is that the law school did not rank students in 1952. On December 20, 1952, six months after graduating from law school, she married John Jay O'Connor III, whom she had met at Stanford Law School. Upon graduation from law school, while her classmate Rehnquist went on to clerk for the Supreme Court, O'Connor had difficulty finding a paying job as an attorney because of her gender. O'Connor found employment as a deputy county attorney in San Mateo, California, after she offered to work for no salary and without an office, sharing space with a secretary. She worked with San Mateo County district attorney Louis Dematteis and deputy district attorney Keith Sorensen. When her husband was drafted, O'Connor decided to pick up and go with him to work in Germany as a civilian attorney for the Army's Quartermaster Corps. They remained there for three years before returning to the states where they settled in Maricopa County, Arizona, to begin their family. They had three sons: Scott (born 1958), Brian (born 1960), and Jay (born 1962). Following Brian's birth, O'Connor took a five-year hiatus from the practice of law. She volunteered in various political organizations, such as the Maricopa County Young Republicans, and served on the presidential campaign for Arizona Senator Barry M. Goldwater in 1964. O'Connor served as assistant Attorney General of Arizona from 1965 to 1969. In 1969, the governor of Arizona appointed O'Connor to fill a vacancy in the Arizona Senate. She ran for and won the election for the seat the following year. By 1973, she became the first woman to serve as Arizona's or any state's Majority Leader. She developed a reputation as a skilled negotiator and a moderate. After serving two full terms, O'Connor decided to leave the Senate. In 1974, O'Connor was elected to the Maricopa County Superior Court serving from 1975 to 1979 when she was elevated to the Arizona State Court of Appeals. She served on the Court of Appeals-Division One until 1981 when she was appointed to the Supreme Court by President Ronald Reagan. Supreme Court Justice-nominee Sandra Day O'Connor talks with President Ronald Reagan outside the White House, July 15, 1981. On July 7, 1981, Reagan – who had pledged during his 1980 presidential campaign to appoint the first woman to the Court – announced he would nominate O'Connor as an Associate Justice of the Supreme Court to replace the retiring Potter Stewart. O'Connor received notification from President Reagan of her nomination on the day prior to the announcement and did not know that she was a finalist for the position. 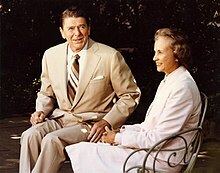 Reagan wrote in his diary on July 6, 1981: "Called Judge O'Connor and told her she was my nominee for supreme court. Already the flak is starting and from my own supporters. Right to Life people say she is pro abortion. She declares abortion is personally repugnant to her. I think she'll make a good justice." O'Connor told Reagan she did not remember whether she had supported the view of repealing Arizona's law banning abortion. However, she had cast a preliminary vote in the Arizona State Senate in 1970 in favor of a bill to repeal the state's criminal-abortion statute. In 1974, O'Connor had opined against a measure to prohibit abortions in some Arizona hospitals. Pro-life and religious groups opposed O'Connor's nomination because they suspected, correctly, she would not be willing to overturn Roe v Wade. U.S. Senate Republicans, including Don Nickles of Oklahoma, Steve Symms of Idaho, and Jesse Helms of North Carolina called the White House to express their discontent over the nomination; Nickles said he and "other profamily Republican senators would not support" O'Connor. Helms, Nickles, and Symms nevertheless voted for confirmation. Reagan formally nominated O'Connor on August 19, 1981. Conservative activists such as the Reverend Jerry Falwell, Howard Phillips, and Peter Gemma also spoke out against the nomination. Gemma called the nomination "a direct contradiction of the Republican platform to everything that candidate Reagan said and even President Reagan has said in regard to social issues." Gemma, the executive director of the National Pro-Life Political Action Committee, had sought to delay O'Connor's confirmation by challenging her record, including support for the Equal Rights Amendment. O'Connor's confirmation hearing before the Senate Judiciary Committee began on September 9, 1981. It was the first televised confirmation hearing for a Supreme Court Justice. The confirmation hearing lasted three days and largely focused on the issue of abortion. When asked, O'Connor refused to telegraph her views on abortion, and she was careful not to leave the impression that she supported abortion rights. The Judiciary Committee approved O'Connor with seventeen votes in favor and one vote of present. On September 21, O'Connor was confirmed by the U.S. Senate with a vote of 99–0; Senator Max Baucus of Montana was absent from the vote, and sent O'Connor a copy of A River Runs Through It by way of apology. In her first year on the Court she received over 60,000 letters from the public, more than any other justice in history. 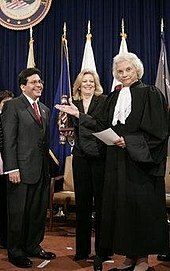 Justice O'Connor presents Alberto Gonzales to the audience after swearing him in as U.S. Attorney General, as Becky Gonzales looks on. 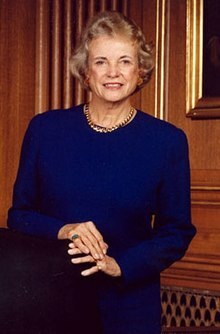 Sandra Day O'Connor was part of the federalism movement and approached each case as narrowly as possible, avoiding generalizations that might later "paint her into a corner" for future cases. Initially, her voting record aligned closely with the conservative William Rehnquist (voting with him 87% of the time her first three years at the Court). From that time until 1998, O'Connor's alignment with Rehnquist ranged from 93.4% to 63.2%, hitting above 90% in three of those years. In nine of her first sixteen years on the Court, O'Connor voted with Rehnquist more than with any other justice. Later on, as the Court's make-up became more conservative (e.g., Anthony Kennedy replacing Lewis Powell, and Clarence Thomas replacing Thurgood Marshall), O'Connor often became the swing vote on the Court. However, she usually disappointed the Court's more liberal bloc in contentious 5–4 decisions: from 1994 to 2004, she joined the traditional conservative bloc of Rehnquist, Antonin Scalia, Anthony Kennedy, and Thomas 82 times; she joined the liberal bloc of John Paul Stevens, David Souter, Ruth Bader Ginsburg, and Stephen Breyer only 28 times. O'Connor's relatively small shift away from conservatives on the Court seems to have been due at least in part to Thomas's views. When Thomas and O'Connor were voting on the same side, she would typically write a separate opinion of her own, refusing to join his. In the 1992 term, O'Connor did not join a single one of Thomas' dissents. McConnell v. FEC, 540 U.S. 93 (2003), upholding the constitutionality of most of the McCain-Feingold campaign-finance bill regulating "soft money" contributions. Grutter v. Bollinger, 539 U.S. 306 (2003) and Gratz v. Bollinger, 539 U.S. 244 (2003), O'Connor wrote the opinion of the Court in Grutter and joined the majority in Gratz. In this pair of cases, the University of Michigan's undergraduate admissions program was held to have engaged in unconstitutional reverse discrimination, but the more-limited type of affirmative action in the University of Michigan Law School's admissions program was held to have been constitutional. Lockyer v. Andrade, 538 U.S. 63 (2003): O'Connor wrote the majority opinion, with the four conservative justices concurring, that a 50-year to life sentence without parole for petty shoplifting a few children's videotapes under California's three strikes law was not cruel and unusual punishment under the Eighth Amendment because there was no "clearly established" law to that effect. Leandro Andrade, a Latino nine year Army veteran and father of three, will be eligible for parole in 2046 at age eighty-seven. Zelman v. Simmons-Harris, 536 U.S. 639 (2002), O'Connor joined the majority holding that the use of school vouchers for religious schools did not violate the First Amendment's Establishment Clause. United States v. Lopez, 514 U.S. 549 (1995): O'Connor joined a majority holding unconstitutional the Gun-Free School Zones Act as beyond Congress's Commerce Clause power. Bush v. Gore, 531 U.S. 98 (2000), O'Connor joined with four other justices on December 12, 2000, to rule on the Bush v. Gore case that ceased challenges to the results of the 2000 presidential election (ruling to stop the ongoing Florida election recount and to allow no further recounts). This case effectively ended Gore's hopes to become president. Some legal scholars[who?] have argued that she should have recused herself from this case, citing several reports that she became upset when the media initially announced that Gore had won Florida, with her husband explaining that they would have to wait another four years before retiring to Arizona. Webster v. Reproductive Health Services, 492 U.S. 490 (1989): This decision upheld as constitutional state restrictions on second trimester abortions that are not necessary to protect maternal health, contrary to the original trimester requirements in Roe v. Wade. Although O'Connor joined the majority, which also included Rehnquist, Scalia, Kennedy and Byron White, in a concurring opinion she refused to explicitly overturn Roe. On February 22, 2005, with Rehnquist and Stevens (who were senior to her) absent, she became the senior justice presiding over oral arguments in the case of Kelo v. City of New London and becoming the first woman to do so before the Court. Justice O'Connor was unpredictable in many of her court decisions, especially those regarding First Amendment Establishment Cause issues. Avoiding ideology, she decided on a case-by-case basis and voted with careful deliberation in a way that she felt benefited individual rights and the Constitution (which she viewed to be "an ever changing work in progress.") Barry Lynn, executive director of Americans United for Separation of Church and State, said, "O'Connor was a conservative, but she saw the complexity of church-state issues and tried to choose a course that respected the country's religious diversity" (Hudson 2005). O'Connor voted in favor of religious institutions,[clarification needed] such as in Zelman v. Simmons-Harris, Mitchell v. Helms, and Rosenberger v. University of Virginia. Conversely, in Lee v. Weisman she was part of the majority in the case that saw religious prayer and pressure to stand in silence at a graduation ceremony as part of a religious act that coerced people to support or to participate in religion, which is strictly prohibited by the Establishment Clause. This is consistent with a similar case, Santa Fe Independent School District v. Doe, involving prayer at a school football game. In this case O'Connor joined the majority opinion that stated prayer at school football games violates the Establishment Clause. O'Connor was the first justice to articulate the "no endorsement" standard for the Establishment Clause. In Lynch v. Donnelly, O'Connor signed onto a five-justice majority opinion holding that a nativity scene in a public Christmas display did not violate the First Amendment. She penned a concurrence in that case, opining that the crèche was not violative of the Establishment Clause because it did express an endorsement or disapproval of any religion. According to law professor Jeffrey Rosen, "O'Connor was an eloquent opponent of intrusive group searches that threatened privacy without increasing security. In a 1983 opinion upholding searches by drug-sniffing dogs, she recognized that a search is most likely to be considered constitutionally reasonable if it is very effective at discovering contraband without revealing innocent but embarrassing information." Washington College of Law law professor Andrew Taslitz, referencing O'Connor's dissent in a 2001 case, said of her Fourth Amendment jurisprudence: "O'Connor recognizes that needless humiliation of an individual is an important factor in determining Fourth Amendment reasonableness." O'Connor once quoted the social contract theory of John Locke as influencing her views on the reasonableness and constitutionality of government action. In the 1990 and 1995 Missouri v. Jenkins rulings, O'Connor voted with the majority that district courts had no authority to require the state of Missouri to increase school funding in order to counteract racial inequality. In the 1991 Freeman v. Pitts case, O'Connor joined a concurring opinion in a plurality, agreeing that a school district that had formerly been under judicial review for racial segregation could be freed of this review, even though not all desegregation targets had been met. Law professor Herman Schwartz criticized these rulings, writing that in both cases "both the fact and effects of segregation were still present." In McCleskey v. Kemp in 1987, O'Connor joined a 5–4 majority that voted to uphold the death penalty for an African American man, Warren McCleskey, convicted of killing a white police officer, despite statistical evidence that black defendants were more likely to receive the death penalty than others both in Georgia and in the U.S. as a whole. In 1996's Shaw v. Hunt and Shaw v. Reno, O'Connor joined a Rehnquist opinion, following an earlier precedent from an opinion she authored in 1993, in which the Court struck down an electoral districting plan designed to facilitate the election of two black representatives out of twelve from North Carolina, a state that had not had any black representative since Reconstruction, despite being approximately 20% black—the Court held that the districts were unacceptably gerrymandered and O'Connor called the odd shape of the district in question, North Carolina's 12th, "bizarre". Law Professor Herman Schwartz called O'Connor "the Court's leader in its assault on racially oriented affirmative action," although she joined with the Court in upholding the constitutionality of race-based admissions to universities. In 2003, she authored a majority Supreme Court opinion (Grutter v. Bollinger) saying racial affirmative action shouldn't be constitutional permanently, but long enough to correct past discrimination—with an approximate limit of around 25 years. The Christian right element in the Reagan coalition strongly supported him in 1980, in the belief that he would appoint Supreme Court justices to overturn Roe vs Wade. They were astonished and dismayed when his first appointment was O'Connor, whom they feared would tolerate abortion. They worked hard to defeat her confirmation but failed. In her confirmation hearings and early days on the Court, O'Connor was carefully ambiguous on the issue of abortion, as some conservatives questioned her pro-life credentials on the basis of some of her votes in the Arizona legislature. O'Connor generally dissented from 1980s opinions which took an expansive view of Roe v. Wade; she criticized that decision's "trimester approach" sharply in her dissent in 1983's City of Akron v. Akron Center for Reproductive Health. She criticized Roe in Thornburgh v. American College of Obstetricians and Gynecologists: "... I dispute not only the wisdom but also the legitimacy of the Court's attempt to discredit and pre-empt state abortion regulation regardless of the interests it serves and the impact it has." In 1989, O'Connor stated during the deliberations over the Webster case that she would not overrule Roe. While on the Court, O'Connor did not vote to strike down any restrictions on abortion until Hodgson v. Minnesota in 1990. O'Connor allowed certain limits to be placed on access to abortion, but supported the fundamental right to abortion protected by the Due Process Clause of the Fourteenth Amendment. In Planned Parenthood v. Casey, O'Connor used a test she had originally developed in City of Akron v. Akron Center for Reproductive Health to limit the holding of Roe v. Wade, opening up a legislative portal where a State could enact measures so long as they did not place an "undue burden" on a woman's right to an abortion. Casey revised downward the standard of scrutiny federal courts would apply to state abortion restrictions, a major departure from Roe. However it preserved Roe's core constitutional precept: that the Fourteenth Amendment implies and protects a woman's fundamental right to control the outcomes of her reproductive actions. Writing the plurality opinion for the Court, O'Connor, along with Justices Kennedy and Souter, famously declared: "At the heart of liberty is the right to define one's own concept of existence, of meaning, of the universe, and of the mystery of human life. Beliefs about these matters could not define the attributes of personhood were they formed under compulsion of the State." The impressions we create in this world are important and can leave their mark ... [T]here is talk today about the "internationalization of legal relations". We are already seeing this in American courts, and should see it increasingly in the future. This does not mean, of course, that our courts can or should abandon their character as domestic institutions. But conclusions reached by other countries and by the international community, although not formally binding upon our decisions, should at times constitute persuasive authority in American courts—what is sometimes called "transjudicialism". In the speech she noted the 2002 Court case Atkins v. Virginia, in which the majority decision (which included her) cited disapproval of the death penalty in Europe as part of its argument. This speech, and the general concept of relying on foreign law and opinion, was widely criticized by conservatives. In May 2004, a committee in the U.S. House of Representatives responded by passing a non-binding resolution, the "Reaffirmation of American Independence Resolution", stating that "U.S. judicial decisions should not be based on any foreign laws, court decisions, or pronouncements of foreign governments unless they are relevant to determining the meaning of American constitutional and statutory law." O'Connor once quoted the constitution of the Middle Eastern nation of Bahrain, which states that "[n]o authority shall prevail over the judgement of a judge, and under no circumstances may the course of justice be interfered with." Further, "[i]t is in everyone's interest to foster the rule-of-law evolution." O'Connor proposed that such ideas be taught in American law schools, high schools and universities. Critics contend that such thinking is contrary to the U.S. Constitution and establishes a rule of man, rather than law. In her retirement, she has continued to speak and organize conferences on the issue of judicial independence. O'Connor's case-by-case approach routinely placed her in the center of the Court and drew both criticism and praise. The Washington Post columnist Charles Krauthammer, for example, described her as lacking a judicial philosophy and instead displaying "political positioning embedded in a social agenda." Conservative commentator, Ramesh Ponnuru, wrote that, even though O'Connor "has voted reasonably well", her tendency to issue very case-specific rulings "undermines the predictability of the law and aggrandizes the judicial role." O'Connor has said she felt a responsibility to demonstrate women could do the job of justice. She faced some practical concerns, including the lack of a woman's restroom near the Courtroom. Two years after O'Connor joined the Court, The New York Times published an editorial which mentioned the "nine men" of the "SCOTUS", or Supreme Court of the United States. O'Connor responded with a letter to the editor reminding the Times that the Court was no longer composed of nine men and referred to herself as FWOTSC (First Woman On The Supreme Court). In several speeches broadcast nationally on the cable network C-SPAN, she mentioned feeling some relief from the media clamor when Ruth Bader Ginsburg joined her as an Associate Justice of the Court in 1993. In May 2010, O'Connor warned female Supreme Court nominee Elena Kagan about the "unpleasant" process of confirmation hearings. In 2003, she wrote a book titled The Majesty of the Law: Reflections of a Supreme Court Justice (ISBN 0-375-50925-9). In 2005, she wrote a children's book, Chico, named for her favorite horse, which gives an autobiographical description of her childhood. On December 12, 2000, The Wall Street Journal reported that O'Connor was reluctant to retire with a Democrat in the presidency: "At an Election Night party at the Washington, D.C. home of Mary Ann Stoessel, widow of former Ambassador Walter Stoessel, the justice's husband, John O'Connor, mentioned to others her desire to step down, according to three witnesses. But Mr. O'Connor said his wife would be reluctant to retire if a Democrat were in the White House and would choose her replacement. Justice O'Connor declined to comment." 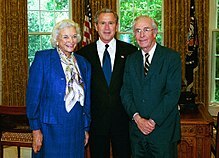 Justice O'Connor and her husband John O'Connor with President George W. Bush in May 2004. By 2005, the composition of the Court had been unchanged for eleven years, the second-longest period in American history without any such change. Rehnquist was widely expected to be the first justice to retire during Bush's term, owing to his age and his battle with cancer, although rumors of O'Connor's possible retirement circulated as well. Before deciding to retire, O'Connor consulted Rehnquist on his plans in an attempt to avoid having two retirements at the same time. On July 1, 2005, O'Connor announced her intention to retire. In her letter to Bush, she stated that her retirement from active service would take effect upon the confirmation of her successor. Her letter did not provide a reason for her departure; however, a Supreme Court spokeswoman confirmed O'Connor was leaving to spend time with her husband, who was suffering from Alzheimer's disease. At her retirement she was still in good health, an exception to the usual practice of justices serving until death or nearly incapacitated. On July 19, Bush nominated D.C. Circuit Judge John Roberts to succeed O'Connor. O'Connor heard the news over the car radio on the way back from a fishing trip. She felt he was an excellent and highly qualified choice—he had argued numerous cases before the Court during her tenure. However, she was disappointed her replacement was not a woman. O'Connor had expected to leave the Court before the next term started on October 3, 2005. However, Rehnquist died on September 3, creating an immediate vacancy on the Court. Two days later, Bush withdrew Roberts as his nominee for her seat and instead appointed him to fill the vacant office of Chief Justice. O'Connor agreed to stay on the Court until her replacement was named and confirmed. She spoke at the late Chief Justice's funeral. On October 3, Bush nominated White House Counsel Harriet Miers to replace O'Connor. After much criticism and controversy over her nomination, on October 27, Miers asked Bush to withdraw her nomination. Bush accepted, reopening the search for O'Connor's successor. The continued delays in confirming a successor further extended O'Connor's time on the Court. She continued to hear oral argument on cases, including cases dealing with controversial issues such as physician-assisted suicide and abortion. O'Connor's last Court opinion, Ayotte v. Planned Parenthood of New England, written for a unanimous court, was a procedural decision that involved a challenge to a New Hampshire abortion law. On October 31, Bush nominated Third Circuit Judge Samuel Alito to replace O'Connor; Alito was confirmed and sworn in on January 31, 2006. After retiring, she continued to hear cases and rendered over a dozen opinions in federal appellate courts across the country, filling in as a substitute judge when vacations or vacancies leave their three-member panels understaffed. 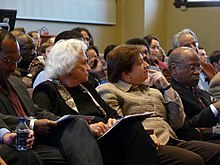 O'Connor in 2008 with Harvard Law School Dean Elena Kagan. Kagan became the fourth female Justice on the Court. During a March 2006 speech at Georgetown University, O'Connor said some political attacks on the independence of the Courts pose a direct threat to the constitutional freedoms of Americans. She said "any reform of the system is debatable as long as it is not motivated by 'nakedly partisan reasoning' retaliation because congressmen or senators dislike the result of the cases. Courts interpret the law as it was written, not as the congressmen might have wished it was written", and "it takes a lot of degeneration before a country falls into dictatorship, but we should avoid these ends by avoiding these beginnings." She echoed her concerns for an independent judiciary during the dedication address at the Elon University School of Law in September of that same year. On November 19, 2008, O'Connor published an introductory essay to a themed issue on judicial accountability in the Denver University Law Review. She calls for a better public understanding of judicial accountability. On November 7, 2007, at a conference on her landmark opinion in Strickland v. Washington (1984) sponsored by the Constitution Project, highlighted the lack of proper legal representation for many of the poorest defendants. O'Connor also urged the creation of a system for "merit selection for judges," a cause for which she had frequently advocated. On August 7, 2008, O'Connor and Abdurrahman Wahid, former President of Indonesia, wrote an editorial in the Financial Times stating concerns about the threatened imprisonment of Malaysian opposition leader Anwar Ibrahim. Following the Court's Citizens United v. Federal Election Commission decision on corporate political spending, O'Connor offered measured criticism of the decision, telling Georgetown law students and lawyers, "that the Court has created an unwelcome new path for wealthy interests to exert influence on judicial elections." O'Connor argued in favor of President Barack Obama naming the replacement for Antonin Scalia in February 2016, mere days after Scalia's death, opposing Republican arguments that the next president should get to fill the vacancy. She said, "I think we need somebody there to do the job now and let's get on with it"; and that "[y]ou just have to pick the best person you can under the circumstances, as the appointing authority must do. It's an important position and one that we care about as a nation and as a people. And I wish the president well as he makes choices and goes down that line. It's hard." Judge William H. Pryor, Jr., a conservative jurist, has criticized O'Connor's speeches and op-eds for hyperbole and factual inaccuracy, based in part on O'Connor's opinions as to whether judges face a rougher time in the public eye today than in the past. O'Connor has reflected on her time on the Supreme Court by saying that she regrets the Court hearing the Bush v. Gore case in 2000 because it "stirred up the public" and "gave the Court a less-than-perfect reputation." The former justice told the Chicago Tribune that "Maybe the Court should have said, 'We're not going to take it, goodbye,' ... It turned out the election authorities in Florida hadn't done a real good job there and kind of messed it up. And probably the Supreme Court added to the problem at the end of the day." As a Retired Supreme Court Justice (roughly equivalent to senior status for judges of lower federal courts), O'Connor continued to receive a full salary, maintained a staffed office with at least one law clerk, and heard cases on a part-time basis in federal district courts and courts of appeals as a visiting judge. By 2008, O'Connor had sat for cases with the 2nd, 8th, and 9th Circuits. O'Connor heard an Arizona voting rights case which the Supreme Court later reviewed. In Arizona v. Inter Tribal Council of Arizona, a 7-2 majority affirmed O'Connor and the rest of 9th Circuit panel, and struck down a provision of Arizona's voting registration law. O'Connor hired a law clerk for the October 2015 term, but did not hire a law clerk for the subsequent term. She stated that she planned to travel, spend time with family, and, because of her fear of the attacks on judges by legislators, would work with the American Bar Association on a commission to help explain the separation of powers and the role of judges. She also announced that she was working on a new book, which will focus on the early history of the Court. She is a trustee on the board of the Rockefeller Foundation. O'Connor was a member of the 2006 Iraq Study Group, appointed by the U.S. Congress. In October 2006, O'Connor sat as a member of panels of the United States Courts of Appeals for the Second, Eighth, and Ninth Circuits, to hear arguments in one-day's cases in each court. O'Connor chaired the Jamestown 2007 celebration, commemorating the 400th anniversary of the founding of the colony at Jamestown, Virginia in 1607. Her appearances in Jamestown dovetailed with her appearances and speeches as chancellor at The College of William & Mary nearby. The four women who have served on the Court (from left to right: O'Connor and Justices Sonia Sotomayor, Ruth Bader Ginsburg, and Elena Kagan) on October 1, 2010, prior to Justice Kagan's Investiture Ceremony. As of Spring 2006, O'Connor taught a two-week course called "The Supreme Court" at the University of Arizona's James E. Rogers College of Law every spring semester. In the fall of 2007, O'Connor and W. Scott Bales taught a course at the Sandra Day O'Connor College of Law at Arizona State University. She wrote the 2013 book Out of Order: Stories from the History of the Supreme Court. On May 15, 2006, O'Connor gave the commencement address at the William & Mary School of Law, where she said that judicial independence is "under serious attack at both the state and national level". In 2008, O'Connor was named an inaugural Harry Rathbun Visiting Fellow by the Office for Religious Life at Stanford University. On April 22, 2008, she gave "Harry's Last Lecture on a Meaningful Life" in honor of the former Stanford Law professor who shaped her undergraduate and law careers. On September 17, 2014, O'Connor appeared on the television show Jeopardy! and provided a couple of video answers to the category 'Supreme Court' which appeared on the show. On the same day in Concord, New Hampshire, she gave a talk alongside her former colleague Justice David Souter about the importance of meaningful civics education in the United States. In February 2009, O'Connor launched Our Courts, a website she created to offer interactive civics lessons to students and teachers because she was concerned about the lack of knowledge among most young Americans about how their government works. She also serves as a co-chair with Lee H. Hamilton for the Campaign for the Civic Mission of Schools. On March 3, 2009, O'Connor appeared on the satirical television program The Daily Show with Jon Stewart to promote the website. In August 2009, the website added two online interactive games. The initiative expanded, becoming iCivics in May 2010, and continues to offer free lessons plans, games, and interactive videogames for middle and high school educators. She served on the Board of Trustees of the National Constitution Center in Philadelphia, a museum dedicated to the U.S. Constitution. By November 2015, O'Connor had transitioned to being a Trustee Emeritus for the Center. She was a member of the Junior League of Phoenix. In 2009, O'Connor founded the 501(c)3 non-profit organization now known as the Sandra Day O'Connor Institute. Its programs are dedicated to promoting civil discourse, civic engagement, and civics education. O'Connor serves as Founder and Advisor to the O'Connor Institute. In April 2013, the Board of Directors of Justice at Stake, a national judicial reform advocacy organization, announced that O'Connor would be joining the organization as Honorary Chair." O'Connor is the Co-Chair of the National Advisory Board at the National Institute for Civil Discourse (NICD). The institute was created at the University of Arizona after the shooting of former Congresswoman Gabrielle Giffords in 2011, that killed 6 people and wounded 13 others. Upon her appointment to the Supreme Court, O'Connor and her husband moved to the Kalorama area of Washington, D.C. The O'Connors became active in the Washington D.C. social scene. Sandra Day O'Connor played tennis and golf in her spare time. She is a baptized member of The Episcopal Church. O'Connor was successfully treated for breast cancer in 1988 (she also had her appendix removed that year). That same year, John O'Connor left the Washington, D.C. law firm of Miller & Chevalier for a practice which required him to split his time between Washington, D.C. and Phoenix. Her husband suffered from Alzheimer's disease for nearly 20 years, until his death in 2009, and she became involved in raising awareness of the disease. After retiring from the Court, O'Connor moved to Phoenix, Arizona. In October 2018, O'Connor announced her effective retirement from public life after disclosing that she had been diagnosed with the early stages of Alzheimer's-like dementia. ^ "O'Connor, Sandra Day". Federal Judicial Center. Archived from the original on March 6, 2004. Retrieved March 21, 2006. ^ "The World's Most Powerful Women". Forbes. August 20, 2004. Archived from the original on March 15, 2009. Retrieved March 4, 2009. ^ See "Sandra Day O'Connor". Oyez. ^ a b c d e Heilpern, John (April 2013). "Sandra Day O'Connor on Growing Up with Guns and Her Views on Assault Weapons". The Hive. Retrieved August 24, 2017. ^ a b c d e f g h i j k l m Kamen, Al; Williams, Marjorie (June 11, 1989). "How Sandra Day O'Connor became the most powerful woman in 1980s America". The Washington Post. Retrieved October 29, 2017. ^ Staff, News 4 Tucson. "Former Pima County Supervisor Ann Day dies at the age of 77". Archived from the original on May 9, 2016. Retrieved May 8, 2016. ^ Washington Valdez, Diana (July 2, 2005). "Hometown stars – Sandra Day O'Connor". El Paso Times. Retrieved December 19, 2010. ^ a b Cool, Kevin (2006-01-01). "Front and Center". Stanford Alumni Magazine. Stanford University. Retrieved 2018-06-04. ^ "Transcript: O'Connor on Fox". Fox News Channel. July 1, 2005. Archived from the original on May 23, 2007. Retrieved December 18, 2006. ^ "Q & A: Supreme Court Justice Sandra Day O'Connor". Retrieved June 13, 2013. ^ Debbie Kornmiller, "O'Connor's class rank an error that will not die", Arizona Daily Star (July 10, 2005). Archived at "O'Connor's class rank an error that will not die". Retrieved June 13, 2013. ^ a b "Sandra Day O'Connor's Peninsula Ties". San Mateo Daily Journal. Retrieved 2018-06-04. ^ a b c Haag, Matt (October 23, 2018). "Sandra Day O'Connor, First Woman on Supreme Court, Reveals Dementia Diagnosis". The New York Times. Retrieved October 26, 2018. ^ a b c d "'Out Of Order' At The Court: O'Connor On Being The First Female Justice". Fresh Air. March 5, 2013. Retrieved March 5, 2013. ^ Baughman, J. (Ed.). (2001). O'Connor, Sandra Day 1930-. American Decades, 9. 21. Sept. 2016. ^ a b "John J. O'Connor III, 79; husband of Supreme Court justice". The Washington Post. November 12, 2009. Retrieved October 4, 2012. ^ Phelps, S. (Ed.). (2002). O'Connor, Sandra Day (1930 - ). World of Criminal Justice, 20. Sept. 2016. ^ "LAPR - State Library of Arizona". apps.azlibrary.gov. Archived from the original on May 10, 2017. Retrieved March 31, 2017. ^ a b Williams, Marjorie; Williams, Marjorie (2016-03-29). "How Sandra Day O'Connor became the most powerful woman in 1980s America". The Washington Post. ISSN 0190-8286. Retrieved 2017-03-31. ^ "General Election Canvass, 1974, p. 5" (PDF). Arizona Secretary of State. Archived from the original (PDF) on December 21, 2016. Retrieved February 25, 2016. ^ "SANDRA D. O'CONNOR". www.azcourts.gov. Retrieved March 31, 2017. ^ a b James Taranto; Leonard Leo (2004). Presidential Leadership. Wall Street Journal Books. ISBN 978-0-7432-7226-1. Retrieved October 20, 2008. ^ a b "1981 Year in Review: Reagan Foreign Policy Speech/O'Connor Appointed to Supreme Court". ^ Transcript (January 30, 2008). "Transcript of GOP debate at Reagan Library". CNN. June 30, 2008. Retrieved August 27, 2009. ^ "CQ Senate Votes 271–278" (PDF). CQ Almanac. 47-S. 1981. ^ Julia Malone (July 8, 1981). "A closer look at nation's first woman high court nominee". Christian Science Monitor. Retrieved May 20, 2016. ^ Julia Malone (September 3, 1981). "New Right strategy: let's drag out O'Connor's confirmation hearing; Focus: abortion, women's rights, school prayer". Christian Science Monitor. Retrieved May 23, 2016. ^ Greenhouse, Linda (September 10, 1981). "O'Connor Hearings Open on a Note of Friendship". The New York Times. ISSN 0362-4331. Retrieved June 20, 2017. ^ "Cameras in the Court". c-span.org. Retrieved October 27, 2017. ^ a b Greenhouse, Linda (September 16, 1981). "Panel Approves Judge O'Connor". The New York Times. ISSN 0362-4331. Retrieved June 20, 2017. ^ Lowe, Rebecca (August 30, 2011). "Supremely confident: the legacy of Sandra Day O'Connor". The Guardian. ^ Associated Press (July 1, 2005). "Sandra Day O'Connor: The reluctant justice". nbc.com. Retrieved May 20, 2017. ^ a b Op-ed essay Schwartz, Herman (April 12, 1998). "O'Connor as a 'Centrist'? Not When Minorities Are Involved". Los Angeles Times. Retrieved August 28, 2009. ^ "Nine Justices, Ten Years: A Statistical Retrospective" (PDF). Harvard Law Review. 118 (1): 521. November 2004. Archived from the original (PDF) on March 27, 2006. Retrieved August 31, 2011. ^ Lane, Charles (November 1, 2004). "Justices Too Tightlipped on Their Health?". The Washington Post. p. A19. Retrieved December 19, 2010. ^ Neumann, Richard K., Jr. (2003). "Conflicts of interest in Bush v. Gore: Did some justices vote illegally?". Georgetown Journal of Legal Ethics: 34. Archived from the original on 2006-06-15. ^ a b S.M. (October 8, 2013). "Endorsing the endorsement test". The Economist. Retrieved June 21, 2017. ^ Rosen, Jeffrey (November 28, 2010). "The TSA is invasive, annoying – and unconstitutional". The Washington Post. ^ "Regula Pro Lege, Si Deficit Lex: The Latin Sapience of High Judges". The Federal Bar Association. Retrieved November 17, 2016. ^ a b c d O’Connor as a ‘Centrist’? Not When Minorities Are Involved, Herman Schwartz, Los Angeles Times, April 12, 1988. ^ Planned Parenthood of Southeastern Pennsylvania v. Casey, 505 U.S. 833, 851 (1992). ^ (in Italian) Il diritto straniero e la Corte suprema statunitense, in Quaderni costituzionali, giugno 2006. ^ Krauthammer, Charles (July 8, 2005). "Philosophy for a Judge". The Washington Post. Retrieved November 18, 2005. ^ Ponnuru, Ramesh (June 30, 2003). "Sandra's Day". National Review. Archived from the original on September 11, 2005. Retrieved March 18, 2007. ^ a b "Topics: In the Name of the LawOPICS: Legal ABC's". The New York Times. September 29, 1983. ISSN 0362-4331. Retrieved May 22, 2017. ^ "High Court's '9 Men' Were a Surprise to One". The New York Times. October 12, 1983. ISSN 0362-4331. Retrieved June 19, 2017. ^ Clarke, Suzan (May 27, 2010). "Retired Supreme Court Justice Sandra Day O'Connor Backs Elena Kagan Nomination". ABC News. Retrieved December 19, 2010. ^ ABC News (June 1, 2006). "Sandra Day O'Connor Writes Children's Book". ABC News. Retrieved May 11, 2018. ^ "Georgetown Journal of Legal Ethics: "Conflicts of interest in Bush v. Gore: Did some justices vote illegally?"". The Georgetown Journal of Legal Ethics. 2003. Archived from the original on June 15, 2006. Retrieved November 18, 2005. ^ a b c Deane, Daniela; Branigin, William; Barbash, Fred (July 1, 2005). "Supreme Court Justice O'Connor Resigns". The Washington Post. ISSN 0190-8286. Retrieved October 27, 2017. ^ a b c Staff writer (February 5, 2007). "Former Justice O'Connor:'I Would Have Stayed Longer'". The Associated Press via NewsMax Media. Archived from the original on January 30, 2013. Retrieved August 24, 2009. ^ Landers, Rich (October 2005). "Guiding Sandra Day O'Connor". Field & Stream. CX: 21 – via ProQuest. ^ Lodge, Sally (May 28, 2009). "Q & A with Sandra Day O'Connor". Publishers Weekly. Retrieved March 5, 2013. ^ Associated Press (July 1, 2005). "First woman to serve as US supreme court justice retires". The Guardian. ISSN 0261-3077. Retrieved October 27, 2017. ^ a b c Associated Press (October 27, 2005). "O'Connor to remain crucial vote in major cases". msnbc.com. Retrieved October 27, 2017. ^ "Chief Justice Rehnquist dies of thyroid cancer". The Denver Post. September 3, 2005. Retrieved October 27, 2017. ^ Sandalow, Marc (September 5, 2005). "The Supreme Court in Transition: The death of William Rehnquist / Chief justice's passing provides Bush with major opportunity". SFGate. Retrieved October 27, 2017. ^ a b "Bush nominates Roberts as chief justice". www.cnn.com. September 6, 2005. Retrieved October 28, 2017. ^ Alfano, Sean (September 7, 2005). "Rehnquist Given Final Farewell". Retrieved October 27, 2017. ^ "Bush picks White House counsel for Supreme Court". www.cnn.com. October 4, 2005. Retrieved October 28, 2017. ^ a b Babington, Charles; Fletcher, Michael A. (October 28, 2005). "Miers, Under Fire From Right, Withdrawn as Court Nominee". ISSN 0190-8286. Retrieved October 28, 2017. ^ "The Supreme Court 2005 Term – Leading Cases" (PDF). Harvard Law Review. 120: 295. 2006. ^ "Bush nominates Alito to Supreme Court". www.cnn.com. November 1, 2005. Retrieved 2017-10-28. ^ "Alito sworn in as nation's 110th Supreme Court justice". www.cnn.com. February 1, 2006. Retrieved October 27, 2017. ^ Bravin, Jess (August 11, 2009). "Change of Venue: In Retirement, Justice O'Connor Still Rules". The Wall Street Journal. ^ "O'Connor Decries Republican Attacks on Courts". ^ a b "Justice O'Connor's Wish: a Wand, not a Gavel", U.S. News & World Report, November 7, 2007. ^ Toobin, Jeffrey (June 11, 2012). "O'Connor and Her Clerk". The New Yorker. ISSN 0028-792X. Retrieved May 10, 2018. ^ Mosk, Matthew (January 26, 2010). "O'Connor Calls Citizens United Ruling A Problem". ABC News. Retrieved December 19, 2010. ^ Cristian Farias, "Sandra Day O'Connor Says Obama Should Get To Replace Justice Scalia", Huffington Post, (February 17, 2016). ^ Pryor Jr, William H. (October 4, 2006). "Neither Force Nor Will, But Merely Judgment". The Wall Street Journal. ^ "Judge Pryor on Judicial Independence" Archived September 27, 2007, at the Wayback Machine, Harvard Law Record, March 15, 2007. ^ "O'Connor questions court's decision to take Bush v. Gore". Chicago Tribune. April 27, 2013. ^ a b Barnes, Robert (March 10, 2013). "Retired Supreme Court justices still judge — and get judged". Washington Post. ISSN 0190-8286. Retrieved May 10, 2018. ^ Brust, Richard (April 2008). "A Cowgirl Rides the Circuits". ABA Journal. Richard Brust. Retrieved May 10, 2018. ^ Mears, Bill (June 17, 2013). "Justices strike down citizenship provision in Arizona voter law - CNN". CNN. Retrieved May 10, 2018. ^ Lat, David (July 8, 2015). "Supreme Court Clerk Hiring Watch: Who Is NOT Retiring From SCOTUS?". Above the Law. Retrieved May 10, 2018. ^ Lat, David (July 22, 2016). "Supreme Court Clerk Hiring Watch: The Official List". Above the Law. Retrieved May 10, 2018. ^ "The College of William and Mary announcement of O'Connor's appointment to Chancellor post". Retrieved November 18, 2005. ^ Whitson, Brian. "Former Defense Secretary Robert Gates '65 to Serve as W&M Chancellor". College of William & Mary. Retrieved September 6, 2011. ^ "Iraq Study Group Members". Archived from the original on November 8, 2006. Retrieved November 10, 2006. ^ Mulcahy, Ned (October 7, 2006). "Paper Chase: O'Connor to hear Second Circuit cases". Jurist. Archived from the original on October 17, 2006. Retrieved November 11, 2006. ^ "Bumpy Start for a Court Cloaked in Grandeur". The New York Times. March 4, 2013. Retrieved March 4, 2013. ^ Whitson, Brian. "Maintain Judicial Independence O'Connor Tells Law Graduates". Archived from the original on September 8, 2006. Retrieved September 19, 2007. ^ "Office for Religious Life at Stanford University". ^ "Constitutionally Speaking New Hampshire". Constitutionallyspeakingnh.org. Retrieved November 2, 2015. ^ "Campaign Steering Committee". Civicmissionofschools.org. Archived from the original on October 24, 2015. Retrieved November 2, 2015. ^ Zehr, Mary Ann (August 25, 2009). "Celebrities Lend Weight to Promote Civics Education". Education Week. Retrieved September 1, 2009. ^ "iCivics (formerly Our Courts) homepage". Retrieved December 19, 2010. ^ "Board of Trustees - National Constitution Center". constitutioncenter.org. Archived from the original on October 24, 2015. Retrieved May 16, 2018. ^ "Board of Trustees - National Constitution Center". constitutioncenter.org. Archived from the original on November 7, 2015. Retrieved May 16, 2018. ^ "Sandra Day O'Connor, The Junior League of Phoenix". www.ajli.org. ^ "Sandra Day O'Connor Institute - Alliance of Arizona Nonprofits". arizonanonprofits.org. Archived from the original on 2018-05-10. Retrieved May 10, 2018. ^ "Supreme Court Justice Sandra Day O'Connor Joins Justice at Stake as Honorary Chair". Justiceatstake.org. April 15, 2013. Retrieved November 2, 2015. ^ "How Sandra Day O'Connor became the most powerful woman in 1980s America". Washington Post. Retrieved 2018-10-06. Flowers, Prudence. "‘A Prolife Disaster’: The Reagan Administration and the Nomination of Sandra Day O’Connor." Journal of Contemporary History 53.2 (2018): 391-414. Montini, E. J. 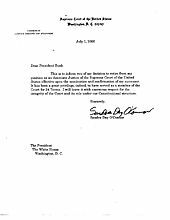 (2005) "Rehnquist is No. 1, O'Connor is No. 3, Baloney is No. 2." The Arizona Republic. Retrieved March 5, 2013. Sandra Day O'Connor at the Biographical Directory of Federal Judges, a public domain publication of the Federal Judicial Center. Booknotes interview with O'Connor on Lazy B: Growing Up On a Cattle Ranch in the American Southwest, January 27, 2002. "O'Connor not bothered by delayed retirement", The Associated Press September 28, 2005. "Sandra Day O'Connor prepares for final days on Supreme Court", Associated Press, September 19, 2005.